1) A lightweight 2D Core + maybe a 3D core. The ADI dumb frame buffer core is just silly and huge IMHO, so replacing that is coming along nicely. After that would be nice to have enough acceleration for wayland/DirectFB in a small MIT'ed open source core, so even the BSD guys would get the benefit. With the ticket to ride core now open sourced, it kinda knocked my desire to continue a complete 3D core beyond the personal achievement desire, though implementation using the Epiphanies for the shaders (possible also portions of the texture samplers) would be good. 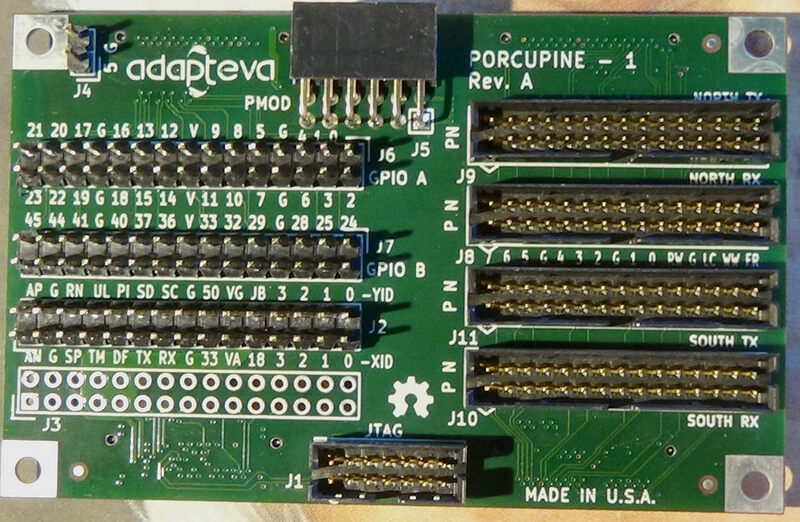 I would like to buy (or receive) a Porcupine breakout board since I want to create a tutorial project for our computer engineering students. I was thinking about creating a controller for a follow the line robot with proximity detection. Being able to directly connect sensors and actuators via a breadboard would greatly simplify and speedup this project. Please send a shipping address to support@adapteva.com. Education and robotics are two of our favorite application areas for the Parallella. Look forward to hearing more about what you are doing. theover wrote: Thanks, Andreas, Iook forward to working a bit on it. Any time frame I can expect to receive it ? Did you send your shipping address/request to "support@adapteva.com"? Me and a team of 4 other designers are building a open hardware modular synthesizer that can act as a hub for live performance with computers, analog modular synthesizers and hardware synthesizers. When the prototype is finished we hope to Kickstart the production. We will be using the amazing dsp capabilities of the parallella and the great connectivity of the fpga to interface with external devices. and well get you hooked up. Will you be writing the dsobsiftware yourselves or do you need some libs? I'm looking at implementing a device that converts MIDI and Open Sound Control (OSC) to CV for modulars and visa versa. The device will also offer CV generation, envelopes, LFOs, clocks etc and CV manipulation. The CV will be at 48k and can be used for audio. I have checked out feasibility using audio over TCP/IP and the board is up to the job but need to get some DACs and ADCs connected up now. I'm quite happy to pay for the board. This would allow easy access to GPIO pins (which is why I'm looking for breakout board . Next logical step would be to do Wishbone AXI bridge, so that ZPUino can get access to Epiphany chip as fast accelerator. This morning the breakout board arrived, and : it cost importation handling and fess . It's such a shame, this European protective market, and those people making their salary only by taxing others, in a way. Tonight I'll try the to adjust some GP IO pints with Linux commands, and connect some L.E.D.s or something to them to test it out, thus far I've only fit it under the Parallella board, and it fits.